There are times when Outlook will have a conflict with an add-in application, such as WinZip Courier, when it is attempting to load. In this situation, Outlook disables the add-in to ensure that the conflict will not occur again. 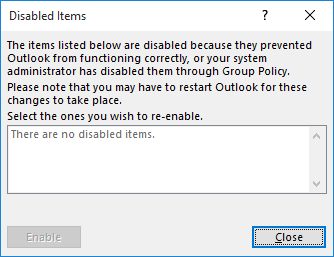 Once on Outlook's disabled list, the add-in will remain there even if it is uninstalled and reinstalled. It must be manually removed from the disabled list in order to become functional again. If you continue to have difficulty, please submit a Technical Support ticket.